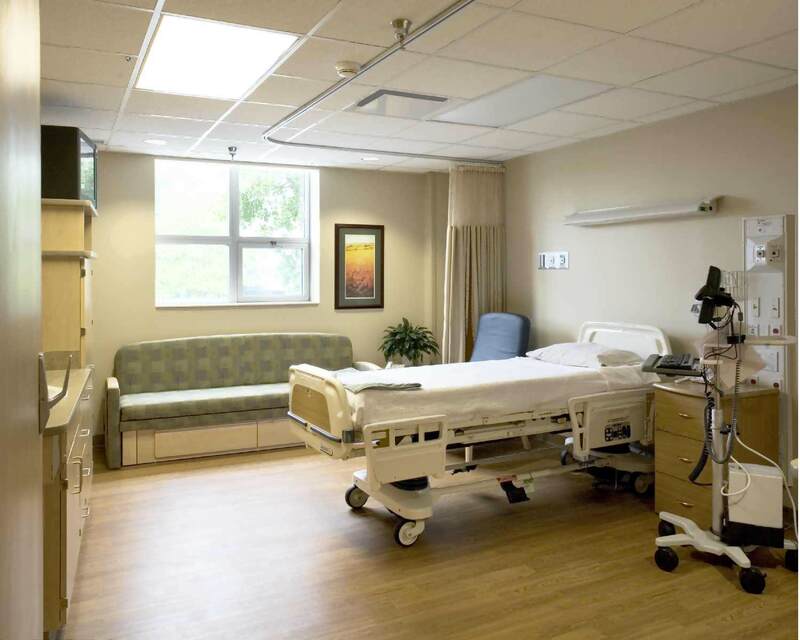 In today’s health care environment, Hospitals have become triage facilities. With the onset of an illness or injury, the Hospital’s actual objective is to stabilize and release the patient to a lower cost continuum of care as quickly as possible. Due to the high daily cost of a Hospital stay, all payer groups have continually pressured this outcome. The obvious objective is to release a long term patient to a Home Care environment, thus reducing the cost and shifting the burden the the family. There have been many studies showing improved outcomes and greater patient satisfaction with care provided in the home where the patient is more comfortable. Professional services are being provided on a “home call” basis, such as inhalation therapy, rehabilitation therapy and even the primary care physician’s house call is making a come back. In the home, the primary care provider, often a spouse or adult children, can provide the necessary daily living requirements, except for one. For the long term care of someone who has lost mobility, transfers from bed to wheelchair/commode and even re-positioning can be extremely difficult, if not impossible. When a patient is placed in the home care environment, the necessary goods and services are ordered. Each patient has different needs and requirements. Services and products specifically suited to that patient’s needs are then delivered. In the case of a patient that has severe mobility issues and cannot ambulate without the assistance of a caregiver and an assistive device, a patient lift is ordered and delivered. There are two basic types of lift devices, the overhead lift and the floor-based lift. The overhead lifts range in price from $4000 to as much as $35,000 which can include very expensive installation costs. The floor based lifts range from $1500 to $8000 depending on their features. Present third party payer’s guidelines require the “least costly alternative” to be provided. That is a floor-based Hoyer-style lift, consisting of a manually-operated screw worm gear or hydraulic pump, with reimbursement in the $1500 – $1700 range. Typically home care is provided in a bedroom. Usually this room is limited in size, under 12′ x 12′ or less. When this room is furnished with a bed, nightstand, dresser, TV and other furniture, there is not sufficient room to use and maneuver a floor-based lift. 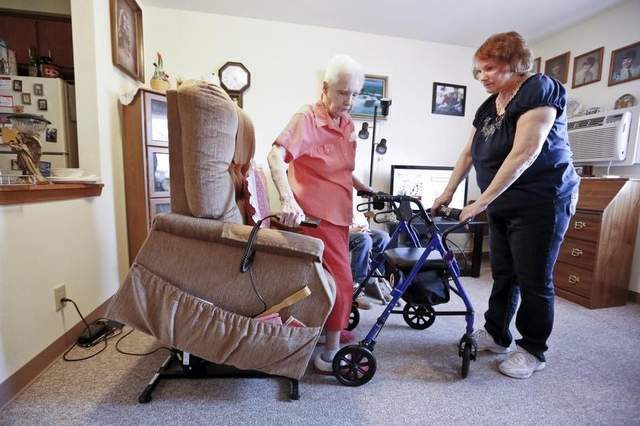 In many cases, the caregiver does not possess the physical ability to operate and move a manual, floor-based lift, especially after the patient is in the lift. Caregivers often stop using their devices because they have a great deal of difficulty using the floor-based lifts. When the device is not used, the patient and caregiver both suffer. Attempting to lift their loved ones can injury the caregiver as well as the patient. If the patient is not ambulated and re-positioned in the bed, the patient’s health can be undermined. Bed sores, respiratory function and digestive system functions can be negatively impacted and cause a re-admittance to the hospital or nursing home. 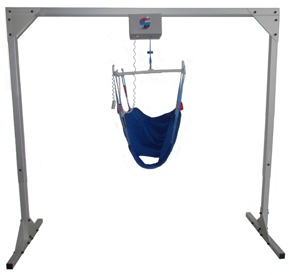 The optimum situation would be to have an electrically powered overhead lifting device, safe and easy to use for both the caregiver and patient, that is funded under present Medicare and Medicaid reimbursement guidelines. In reality, these types of lifts are often not funded and families have to make hard choices on how to use their valuable resources. Traxx Mobility Systems manufactures and sells the TITAN 500, a freestanding overhead patient lift designed for home care. The system does not attach to your home. It allows a single caregiver to transfer a patient safely and comfortably. The rechargeable electric motor and sturdy aluminum frame are rated to lift 500 lbs. Simple, safe and dignified transfers in the home care environment at an affordable price. Our system even comes with a universal sling. 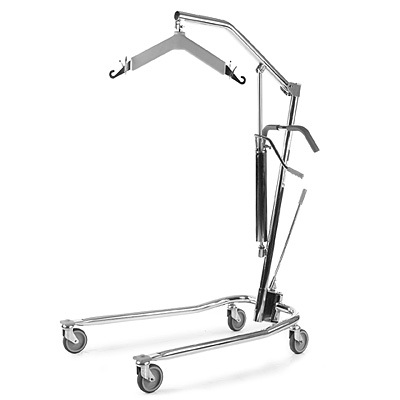 Traxx Mobility Systems TITAN 500 Freestanding Overhead Patient Lift designed for Home Care.